I made that software. That's what I said to Melissa as I was watching NUMB3RS tonight. 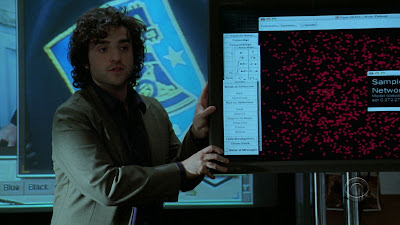 Several people at Wolfram Research work as math consultants for the CBS show and they frequently make use of Mathematica related props on the show. In the past they have shown copies of the Mathematica book, A New Kind of Science, and various posters created with Mathematica. 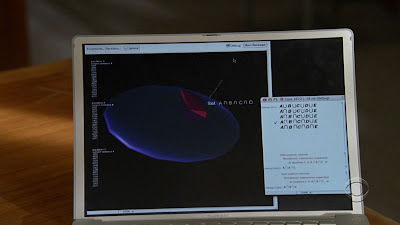 Tonight one of the main characters Charlie was using Mathematica (on Mac OS X even). Okay, so some of the footage may or may not have been special effects, but Mathematica was there. My software was there. Your software was on TV, therefore you were on TV. For heaven's sake - You're a STAR!!! Sean O'Kane has made $100,000. from being on those "SUBWAY" commercials!